‘Tis the season for gingerbread. While you could certainly bake gingerbread any time, gingerbread-themed treats take over in December the way pumpkin does in October. Suddenly it’s everywhere, from coffee to pastries to, as I saw earlier this week, even cereal. There are plenty of ideas for gingerbread treats, and I found this recipe for gingerbread muffins at Betty Crocker after an attempt at gingerbread cupcakes went awry. I adapted the recipe slightly to include a spice glaze, which pairs very well with the spicy notes in the muffin. A word of caution about baking time: I should have pulled them about two minutes before I actually did, so they were drier than I intended. I reheated them in the microwave for about 20 seconds before having them once they’d cooled, and this really helped cut down on the dryness. Preheat oven to 400 degrees. Line a 12-cup muffin tin with paper liners. In a large bowl, combine flour, baking powder, ginger, salt, baking soda, cinnamon, and salt; set aside. In another large bowl, stir together brown sugar, molasses, vegetable oil, milk, and egg until well-blended. Add flour mixture and stir until just moistened, with no dry streaks remaining. Divide batter evenly among the muffin cups, filling about 2/3 to 3/4 full; I used a 2-inch cookie scoop, that that worked well. Bake for 18-20 minutes, until a toothpick comes out clean. Remove from oven, then remove muffins from tin and place on a wire rack to cool. Once muffins are cooled, make the glaze: combine powdered sugar and allspice in a small bowl and add water, about 1 teaspoon at a time, stirring to create a thick glaze. Drizzle over tops of muffins; store in an airtight container at room temperature for up to 3 days. Reheat when serving. My Better Homes & Gardens cookbook (the one with the red and white plaid cover) has a great basic muffin recipe that you can easily enhance with different mix-ins and flavors. I used that recipe as the basis for today’s pecan oat muffins, and I may have gone a bit overboard with the pecans. The next time I make these, I’ll probably scale back my pecan quantity in the batter to 1/4 cup instead of the 1/2 cup I used today. While they are very tasty, they didn’t rise as much as I wanted them to, probably because the pecans weighed down the batter – so they’re a bit on the heavy side. No worries! This is one of the things that I love most about baking – the trial and error, which leads to great ideas for next time. Preheat oven to 400 degrees. Line two muffin tins with paper liners; this recipe yields 18 muffins. Make the streusel: in a medium bowl, combine flour, brown sugar, cinnamon, and allspice. Cut in butter until the mixture looks like coarse crumbs; stir in pecans and oats; set aside. For the muffins: in a large bowl, stir together flour, oats, sugar, baking powder, salt, cinnamon, and allspice. Make a well in the center. In a small bowl, whisk together egg, milk, and cooking oil. Pour into the well in the dry mixture and stir until just combined, then add pecans and stir until no dry streaks remain. Using a two-inch cookie scoop, drop scoops of batter into prepared pans, filling about 2/3 to 3/4 full. Divide streusel mixture among the muffins; I used very generous teaspoonfuls. Bake for 16-20 minutes, until a cake tester comes out clean. Remove muffins from tins and cool completely on a wire rack. To make the drizzle, combine powdered sugar, cinnamon, and allspice. Add water, one-half teaspoon at a time, mixing well until you reach a medium-thick drizzle consistency. Pour drizzle into a zip-top bag, snip off a corner, and pipe drizzle over muffins. 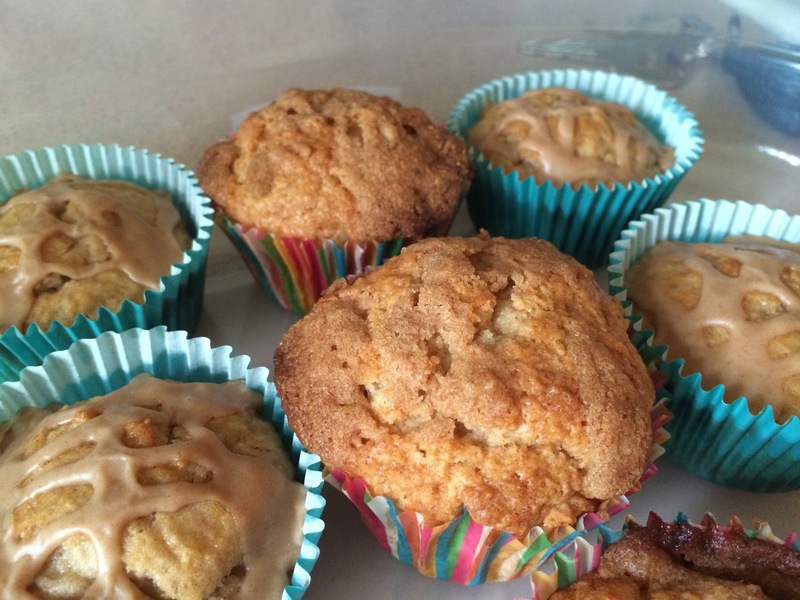 Yesterday I saw a recipe for honey muffins on Taste of Home, a wonderful cooking and baking site. I’m on a low-sodium diet, so I checked out the sodium content in the original recipe and saw it was 242 mg – much too high for one muffin for someone like me. Fortunately, my Aunt Liz sent me some reduced sodium baking powder last week, and I was able to use that to cut down on the sodium in a big way. My muffins have 93 mg each, and I also mixed in some vanilla extract, orange extract, and orange zest into the batter to turn these into honey orange muffins. The end result is not only lower in sodium, but also very tasty. Next time, I might add some chopped pecans to the batter and drizzle on an orange icing once the muffins have cooled. *Rumford makes reduced sodium baking powder; you can find it online. Preheat oven to 400 degrees. Line muffin tins with paper liners; this recipe made 17 muffins for me. In a large glass measuring cup, combine egg, milk, melted butter, honey, vanilla extract, orange extract, and orange zest. Beat with a fork to combine. Pour wet mixture into dry mixture and stir until just combined; batter should be lumpy. Using a 2-inch cookie scoop, drop scoops of batter into prepared pans, filling each well about 3/4 full. Bake for 12-15 minutes, until tops are light golden brown and a cake tester comes out clean. Store in an airtight container for 3-4 days, or freeze cooled muffins for future breakfasts and snacks. Lent begins in just a few days, and Lent always makes me think of my grandparents. My Hungarian-born grandma, Zella, fully embraced my Slovak-American grandpap Andy’s Easter traditions, and growing up just a few doors away from their house, I embraced those traditions as well. Except for eating pig’s feet, of course. Blegh. Both of my grandparents are gone, but this time of year always brings them back to me, in the recipes and practices they taught me as a kid. My grandma made poppy seed roll every year for Easter, so any time I bake with poppy seed I think of her. I had about three-quarters of a jar of poppy seed filling left over from a previous recipe, and I decided to use it in these lemon curd muffins, which I adapted from a “Make it Mine” muffin recipe in my Better Homes & Gardens baking book. I went the lemon poppy seed route, but really kicked up the flavor with lemon curd, lemon extract, and poppy seed filling. I think Grandma Zella would be proud. *You can make your own, but I always use Baker Poppy Seed Filling. **If you don’t have lemon extract, substitute 1/2 teaspoon lemon juice and about 1/2 teaspoon lemon zest. Preheat oven to 350 degrees. Line muffin tins with paper liners; my recipe yielded 21 muffins. In a small bowl, stir together poppy seed filling and lemon extract; set aside. In a large mixing bowl, combine flour, sugar, baking powder, baking soda, and salt; make a well in the center and set aside. In a large glass measuring cup, combine eggs, lemon curd, milk, and vegetable oil and whisk with a fork to combine. Pour into the well in the dry mixture and stir to combine until just moistened; batter will be lumpy. Stir in poppy seeds. Using a 1-inch cookie scoop, drop scoops of batter into prepared tins and spread gently so you have a fairly even layer of batter. Drop a scant 1 teaspoon poppy seed filling into each, then cover with another scoop of batter, filling about 2/3 full. Gently smooth batter so no filling is showing. Bake for 15 minutes, until tops are golden brown and a cake tester inserted at the edge of the muffins comes out clean. Remove muffins from tins immediately and cool completely on a wire rack before glazing. To make glaze, place powdered sugar, poppy seeds, lemon extract, and 1 tablespoon water in a small bowl and stir to combine. Add remaining water if necessary, about 1/2 tablespoon at a time, stirring well after each addition; you want a consistency like thick honey. Dip each muffin into the glaze, then allow glaze to set for a few minutes before serving. Store in an airtight container at room temperature. Most of the world’s cinnamon comes from Sri Lanka, but other countries – like Madagascar, China, Vietnam, and Indonesia – also grow and process this popular spice. My favorite cinnamon is Vietnamese, which has a slightly more spicy flavor than your average, from-the-grocery-store cinnamon. I purchase it at Penzey’s in Pittsburgh’s Strip district, along with Mexican vanilla extract and Tahitian vanilla beans for the baker’s version of a splurge. These muffins include Vietnamese cinnamon of the “extra fancy” variety – and yes, I keep both this and regular, from-the-grocery-store cinnamon in my pantry. I’m a generous measurer of cinnamon as well, so if you’re looking for a more mellow flavor, you can always cut back a bit. These muffins are prepared two ways; first with what the original recipe called a streusel topping, which I expected to be more crumb-like but turned out to be more of a crunchy coating, and second with a cinnamon vanilla drizzle. Whatever you choose, you won’t go wrong – or if you’re feeling really adventurous, do both! I chose to put the streusel crunch on the first batch, and went with the glaze on the second batch because some of my streusel crunch-coated muffins burned at the edges a bit. When dropping your streusel crunch pieces onto your muffins, be careful to keep them as close to the center as possible, as they can spread and burn. Note: this recipe yielded 20 muffins. Preheat oven to 400 degrees. Line muffin tins with paper liners; my recipe yielded 20 muffins. Make the streusel crunch: in a small bowl, combine flour, brown sugar, and cinnamon. Cut in butter, or rub in with your hands, until the mixture comes together; the original recipe said this would go crumb-like, but that didn’t happen to mine. I had to pull it apart and place drops of it on the muffins, rather than sprinkling it. Make the muffins: in a large bowl, combine flour, sugar, brown sugar, baking powder, cinnamon, and salt. Make a well in the center. In a large glass measuring cup, combine milk, melted butter, vanilla, and egg and whisk to combine. Pour into the well in the dry mixture and mix until just combined and no dry streaks remain. Using a 2-inch cookie scoop, drop scoops of dough into prepared muffin tins. If using, place drops of streusel crunch on tops of muffins. Bake for 18-2o minutes, until a cake tester comes out clean. Remove from oven and immediately remove muffins to a wire rack to cool completely if glazing. Make the glaze: in a small bowl, combine powdered sugar and cinnamon, stirring to combine. Add vanilla extract, then add water about 1/4 teaspoon at a time to reach a drizzly consistency. Drizzle over cooled muffins; I placed my drizzle in a small zip-top bag and piped it on, but ypu could just drizzle it with a spoon.